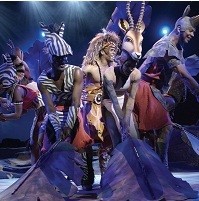 Disney’s award-winning musical THE LION KING is now in its 16th year at London’s Lyceum Theatre and is on its first tour of the UK! Set in a magical land known as the Pridelands, the story of the Lion King begins at an area known as Pride Rock. Enter the Lion King, Mufasa and Queen Sarabi to introduce their newborn cub Simba. The heir to the throne Simba, is stated to overtake leadership of the Pridelands. Unfortunately not everyone is happy about this prospect, more specifically Scar, the selfish brother of the Lion King Mufasa. A spectacular and unforgettable show.